A pair of GOLDEN2-LIKE transcription factors is required for normal chloroplast development in land plant species that encompass the range from bryophytes to angiosperms. 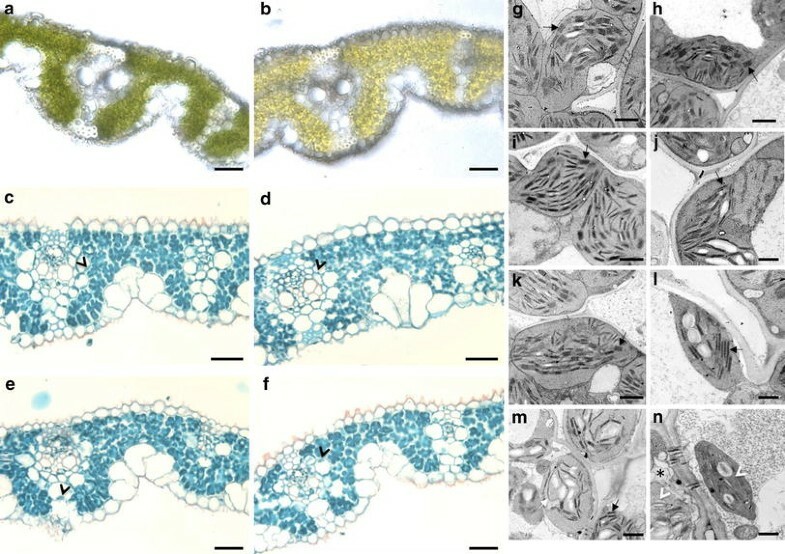 In the C4 plant maize, compartmentalized function of the two GLK genes in bundle sheath and mesophyll cells regulates dimorphic chloroplast differentiation, whereas in the C3 plants Physcomitrella patens and Arabidopsis thaliana the genes act redundantly in all photosynthetic cells. To assess whether the cell-specific function of GLK genes is unique to maize, we analyzed gene expression patterns in the C4 monocot Sorghum bicolor and C4 eudicot Cleome gynandra. Compartmentalized expression was observed in S. bicolor, consistent with the development of dimorphic chloroplasts in this species, but not in C. gynandra where bundle sheath and mesophyll chloroplasts are morphologically similar. The generation of single and double mutants demonstrated that GLK genes function redundantly in rice, as in other C3 plants, despite the fact that GLK gene duplication in monocots preceded the speciation of rice, maize and sorghum. Together with phylogenetic analyses of GLK gene sequences, these data have allowed speculation on the evolutionary trajectory of GLK function. Based on current evidence, most species that retain single GLK genes belong to orders that contain only C3 species. We therefore propose that the ancestral state is a single GLK gene, and hypothesize that GLK gene duplication enabled sub-functionalization, which in turn enabled cell-specific function in C4 plants with dimorphic chloroplasts. In this scenario, GLK gene duplication preconditioned the evolution of C4 physiology that is associated with chloroplast dimorphism. A contribution to the Special Issue on Evolution and Biogenesis of Chloroplasts and Mitochondria. P. Wang and J. Fouracre contributed equally. The online version of this article (doi: 10.1007/s00425-012-1754-3) contains supplementary material, which is available to authorized users. Chloroplast differentiation in flowering plants is influenced by both environmental and developmental cues. From a developmental perspective, a major difference is seen between chloroplast differentiation in C3 and C4 plants. In C3 plants, a single chloroplast type develops in all photosynthetic cells, whereas in many C4 plants, dimorphic chloroplasts are formed in distinct bundle sheath (BS) and mesophyll (M) cells (reviewed in Langdale 2011). C3 chloroplasts accumulate Ribulose Bisphosphate Carboxylase/Oxygenase (RuBisCO), fix CO2 in the Calvin-Benson cycle and form stacked thylakoids. Consistent with the fact that C4 photosynthesis evolved from C3 during land plant evolution (reviewed in Sage et al. 2011), chloroplasts in C4 plants differentiate a C3 state by default. However, in the presence of light, and in cells within a two-cell radius of a vein, distinct C4 BS and M chloroplasts develop (Langdale et al. 1988b). In the BS cells that are immediately adjacent to the veins, chloroplasts accumulate RuBisCO, the Calvin-Benson cycle operates and thylakoid membranes are often (but not always) unstacked. In contrast, M cell chloroplasts develop stacked thylakoids and RuBisCO is absent. Distinct regulatory mechanisms must therefore operate in BS and M cells of C4 plants to control chloroplast development. Very few transcriptional regulators of chloroplast development have been reported in either C3 or C4 plants. Of those identified, GOLDEN2-like (GLK) transcription factors were first characterized in the C4 plant maize (Hall et al. 1998). GLK genes are members of the GARP superfamily (Riechmann et al. 2000) and in maize each member of a paralogous GLK gene pair (ZmG2 and ZmGlk1) functions in a BS or M cell-type specific manner to regulate the proplastid to chloroplast transition (Langdale and Kidner 1994; Hall et al. 1998; Rossini et al. 2001). The ZmG2 gene is expressed in BS cells whereas ZmGlk1 is expressed in M cells. The extent to which compartmentalization of GLK gene function in maize is representative of a more general C4 regulatory mechanism has not yet been investigated. GLK gene pairs have also been identified in the C3 moss Physcomitrella patens (Yasumura et al. 2005; Bravo-Garcia et al. 2009), the eudicot Arabidopsis thaliana (Fitter et al. 2002; Tamai et al. 2002; Waters et al. 2009) and the monocot Oryza sativa (Rossini et al. 2001; Nakamura et al. 2009). In all three cases, both members of the gene pair are expressed in all photosynthetic cells. In P. patens and Arabidopsis, this expression pattern reflects redundant gene function because chloroplast differentiation is not perturbed unless both gene copies are mutated. Unfortunately, the maize, moss and Arabidopsis genes are not orthologous and thus evolutionary trajectories of gene function cannot be inferred from these mutant phenotypes. In rice, OsGLK1 is an ortholog of ZmGlk1 and OsGLK2 is an ortholog of ZmG2 (Rossini et al. 2001). As such, GLK gene duplication in this lineage preceded the speciation of rice and maize. It is thus possible that GLK gene function was sub-functionalized prior to the divergence of the two species. If this were the case, mutations in individual GLK genes would perturb aspects of chloroplast development in rice. An alternative hypothesis is that GLK gene duplication preconditioned compartmentalized C4 function in maize (and perhaps other C4 species) but that in rice the duplicated genes act redundantly. In this case, chloroplast development in rice would only be perturbed in double mutants, as in Arabidopsis and moss. To provide more insight into the evolutionary trajectory of GLK gene function in land plants, we have examined the phylogeny of GLK genes in the context of the current plant genome sequence database, have investigated the expression profile of GLK genes in two more C4 species, and have determined the phenotypic effect of perturbed GLK gene function in rice. Our results suggest that GLK gene duplications were primarily associated with the numerous genome-wide duplications that occurred within the angiosperms. We propose that the retention of multiple GLK copies in the genomes of both C3 and C4 species reflects sub-functionalization. Cleome gynandra L. (Millenium Seedbank, Kew) plants were grown for 10 days in soil under long-day conditions with fluence rates of 150 µmol photon m−2 s−1 and a temperature of 23 °C. Sorghum bicolor L. Moench inbred line BTx623 (USDA-ARS-SPA, Lubbock, TX, USA) was used as the genetic background for northern blot analyses. Sorghum plants were grown in soil in a greenhouse, with the natural diurnal light period in Oxford (UK), and were supplemented with 500 µmol photon m−2 s−1 when necessary, and up to 14 h in winter. The average daytime temperature was 28 °C and the average night temperature was 20 °C. Sorghum bicolor L. hybrid line Tx430 (Pioneer Hi-Bred, Plainview, TX, USA) was used as the genetic background for Illumina sequencing. Plants were grown in soil in a greenhouse, with the natural diurnal light period in Duesseldorf (Germany) and were supplemented with 300 µmol photon m−2 s−1 when necessary, and up to 14 h in winter. Average daytime temperature was 25 °C and average night temperature was 19 °C. Oryza sativa var. japonica cv. Dongjin was used as the genetic background for all rice experiments. Rice plants were grown as described for the BTx623 sorghum line. Osglk1 and Osglk2 single mutants were grown and crossed in the glasshouse at the International Rice Research Institute (IRRI, Los Banos, Philippines). T1 seeds of the Osglk1-2 single mutant and T3 homozygous seeds of the Osglk2-2 mutant were incubated at 45 °C for 5 days to break seed dormancy, germinated on MS medium in petri dishes at 30 °C for 7 days, and then transplanted to pots containing soil. Plants were grown with a day/night temperature of 30/22 ± 3 °C and 65–85 % relative humidity. Osglk1-2 single mutants were PCR screened for the RNAi transgene and only PCR-positive plants were transplanted to pots. One-third of these plants should be homozygous for the transgene and two-thirds should be heterozygous. To identify GLK genes, BLASTP was used to search all of the annotated land plant proteomes on Phytozome v8.0 (http://www.phytozome.net) plus the potato genome sequence (http://potatogenomics.plantbiology.msu.edu/), using the ZmGLK1 amino acid sequence as a query. Results for searches against each proteome were filtered manually to identify GLK genes (distinguished from other GARP family genes by an AREAEAA motif (consensus motif) at the C terminal of the DNA-binding domain). To ensure that all putative GLK genes were identified the amino acid sequences encoded by 5 GLK genes representing a wide range of angiosperm lineages (AtGLK1, GmGLKD, VvGLK, ZmGlk1, OsGLK2) were aligned using MAFFT (Katoh et al. 2005). This alignment was converted to a hidden Markov model and used to search Phytozome v8.0 plant and algal proteomes with an iterative HMMer search algorithm described previously (Eddy 1998; Kelly et al. 2011). Phylogenetic trees of the identified GLK genes were inferred using both Bayesian and maximum likelihood methods. Protein sequences were aligned using MergeAlign (Collingridge and Kelly 2012). A 100 bootstrap maximum likelihood tree was inferred using RAxML (Stamatakis 2006) employing the LG model of sequence evolution (Le and Gascuel 2008) and CAT rate heterogeneity. A 50 % majority-rule consensus tree was calculated from the 100 bootstrap replicates using the python module dendropy (Sukumaran and Holder 2010). Bayesian phylogenetic trees were inferred using mrbayes v3.1.2 (Huelsenbeck and Ronquist 2001) with gamma-distributed substitution rate variation approximated by four discrete categories and shape parameter estimated from the data. The “covarion” model (Galtier 2001) was implemented and four chains were employed, each with a temperature of 0.2. Tree inference was made from a random start tree and allowed to run for 2,500,000 generations. The time taken to reach stationary phase was approximately 700,000 generations and thus the final 1,800,000 trees sampled every 200 generations were used to infer posterior probabilities on topology. Osglk2 T-DNA insertion lines (PFG-3A-13668.L) were ordered from RiceGE: Rice Functional Genomic Express Database http://signal.salk.edu/cgi-bin/RiceGE (An et al. 2003). 15 lines of T2 seeds were received (PFG-3A-13668-01 to PFG-3A-13668-15). DNA was extracted from five seedlings of each line, and PCR was performed using forward (5′-CAATTATGCGGTAGCAGCTG-3′) and reverse (5′-TCTCTGTCCAATAAAATCGAACTTC-3′) primers flanking the insertion, and a T-DNA right border primer (5′-AACGCTGATCAATTCCACAG-3′). The forward and reverse primers were used as a pair to generate a 1,072-bp fragment of the wild-type allele. The forward primer and T-DNA right border primer were used as a pair to generate a shorter fragment of the insertion allele. PCR conditions were 35 cycles of: 95 °C for 30 s, 53 °C for 30 s, 72 °C for 1.5 min. Lines containing the insertion allele were carried through to DNA gel blot analysis. Osglk1 single mutant lines were generated by RNAi knock down of the OsGLK1 gene (Os06g24070) in O. sativa Dongjin. A 305-bp sequence of the OsGLK1 GCT-box (fragment 2 in Fig. 4a) was used as the target sequence. The sequence was first inserted downstream of the potato GA20 oxidase intron in the pUC-RNAi vector (Fang et al. 2008), as a BamHI/XbaI fragment in the sense orientation. The same sequence was then inserted in the antisense orientation into the BglII/SpeI sites of the pUC-RNAi construct that contained the sense fragment. To create the binary construct, the fragment comprising sense and antisense sequences of OsGLK1, separated by the potato GA20 oxidase intron, was excised from pUC-RNAi and inserted into the Pst1 site of pXQAct (Fang et al. 2008) between the rice actin1 promoter and Ocs terminator. Agrobacterium-mediated transformation into wild-type Dongjin callus was performed as described (Nishimura et al. 2006). After selection with G418 and PCR validation, seven regenerated plants were obtained that contained the RNAi construct. To generate a double mutant, a 395-bp sequence between the OsGLK1 gene DNA-binding domain and GCT-box (fragment 1 in Fig. 4a) was used to create an RNAi construct as shown earlier. This construct was transformed into Osglk2-2 mutant callus. After selection with G418 and PCR validation, 20 regenerated plants were obtained that contained the RNAi construct. Unfortunately, none of the regenerated double mutants produced viable seed. An F2 population that segregated double mutants was therefore generated by crossing a homozygous Osglk2-2 single mutant line with a hemizygous Osglk1-2 knockdown line. The resultant F1 progeny were selfed to generate a segregating F2 population. For northern blot analysis, BS and M cells were separated from fully expanded 3rd leaves of S. bicolor inbred line BTx623. M cells were separated enzymatically from leaf tissue essentially as described by Sheen and Bogorad (1985), but with vanadyl ribonucleoside complex omitted from the protoplast washing buffer. Bundle sheath strands were isolated mechanically using a household blender. Leaves were blended and filtered through 60 µM mesh using buffers described by Westhoff et al. (1991). Cell preparations were checked microscopically for purity and immediately frozen in liquid nitrogen before storage at −80 °C. For Illumina sequencing, M and BS cells were separated enzymatically as described previously (Wyrich et al. 1998). C. gynandra BS and M cells were isolated by laser capture microdissection (LCM). Mature leaf tissue was harvested 4 h after dawn and immediately infiltrated with ethanol: acetic acid (3:1, v/v). The tissue was processed through a dehydration series of ethanol and Histoclear and then replaced by Paraplast Xtra. Leaf sections were floated in ethanol on MembraneSlide 1.0 PEN (Zeiss). LCM was performed using Arcturus XT (Life Technologies) and M and BS cells were captured using HS adhesive caps (Life Technologies) following the manufacturer’s instructions. Genomic DNA was isolated using a modified CTAB method (Murray and Thompson 1980). Total leaf RNA was isolated by guanidinium thiocyanate–phenol–chloroform extraction as described by Waters et al. (2008). RNA was extracted from separated sorghum BS and M cells as described by Sheen and Bogorad (1985) (for northern blot analysis) or by Wyrich et al. (1998) (for Illumina sequencing). Total RNA from BS or M cells of C. gynandra harvested by LCM was extracted from three independent replicates using a Picopure RNA isolation kit (Life Technologies) and DNAse treatment. RNA integrity was assessed on a Bioanalyzer 2100 RNA picochip (Agilent). At least 5 ng of RNA for each sample was subsequently amplified through two rounds of amplification using the RiboAmp HS plus RNA amplification kit (Life Technologies). For Illumina sequencing, RNA from five cell preparations of 10-day-old sorghum seedlings was pooled and the mRNA content was purified using the Oligotex mRNA Midi Kit (Qiagen). cDNA was produced using the SMARTer PCR cDNA Synthesis Kit (Clontech) and sent to GATC Biotech AG (Konstanz, Germany) for 40 bp Illumina sequencing using a standard library preparation protocol. Following standard GATC quality filtering, raw reads were mapped to sorghum Sbi1_4 gene models (http://genome.jgi-psf.org/Sorbi1/Sorbi1.info.html) using Bowtie 0.12.8 (Langmead et al. 2009) in the –v alignment mode with up to 3 mismatches and the –best option activated. Differentially expressed genes were calculated using a significance test (Audic and Claverie 1997) followed by a Bonferroni correction. For real-time PCR, first-strand cDNA was synthesized from 5 ng amplified RNA using Superscript II (Invitrogen). Real-Time PCR was performed using SYBRgreen Jumpstart (Sigma) in a rotor-gene-Q system (Qiagen). Relative transcript levels were calculated based on Actin 7 levels. Primer sequences were as follows—CgGLK1: 5′-TCCGACTTGTGCACCGTATGATGT-3′ and 5′-ACCGAATGCCAAATGGAACGACAC-3′; CgGLK2: 5′-AAAGTTACGGGAGACGGTGGGAAA-3′ and 5′-CACGAATTTCCGGTGCAATTCCGA-3′; CgACT7: 5′-TCCGACCCGATGTGATGTTATGGT-3′ and 5′-CAATCACTTTCCGGCTGCAACCAA-3′. DNA and RNA gel blots were prepared and hybridized in 0.45 M NaCl at 65 °C as described previously (Langdale et al. 1988a), using gene-specific probes as follows: SbGLK1 (transcript bases 1558–1864), SbGLK2 (transcript bases 2029–2346), ZmPEPC (pTN1, Langdale et al. 1988a), ZmRbcS (pJL10, Langdale et al. 1988a), OsGLK1 (transcript bases 1543–1856), OsGLK2 (transcript bases 2044–2325), NPTII, GUS (290 bp from the 5′ end of the cDNA amplified using primers 5′-ATGTTACGTCCTGTAG-3′ and 5′-ACTTTGCCGTAATGAGTGACC-3′). Blots were visualized and quantified using a Molecular FX phosphorimager (Bio-Rad, http://www.bio-rad.com/). For light microscopy, thick sections were prepared according to Yamada et al. (2009). One-month-old leaf blades were vacuum infiltrated for 10 min with fixation buffer [50 mM PIPES–NaOH, pH 6.9, 4 mM MgSO4, 10 mM EGTA, 0.1 % (w/v) Triton X-100, 200 µM phenylmethylsulfonyl fluoride, 5 % (v/v) formaldehyde and 1 % (v/v) glutaraldehyde] and then incubated at 4 °C overnight. The fixed segments were then embedded in 5 % (w/v) agar and sectioned at 70–80 µm with a Vibratome Series 1000 Sectioning System. Alternatively, leaf samples were fixed overnight in FAA (4 % formaldehyde, 5 % acetic acid, 50 % ethanol) and embedded in Paraplast Plus. Thin sections (8 µm) were cut using a rotary microtome and stained with Safranin/Fast Green as described previously (Langdale 1994). Sections were viewed and photographed with a Leica DMRB microscope. For transmission electron microscopy, leaf samples were fixed in the dark by immersion in ice-cold fixative (4 % paraformaldehyde, 3 % glutaraldehyde in 0.05 M potassium phosphate buffer, pH 7) followed by vacuum infiltration. Subsequent steps were performed as described previously (Waters et al. 2008). Samples were stained sequentially with 2 % w/v OsO4 and 0.5 % w/v uranyl acetate and embedded in TAAB 812 resin (TAAB Laboratory Equipment, http://www.taab.co.uk). 0.1 µm sections were stained with 0.2 % w/v lead citrate, rinsed in deionized water, and then examined using a Zeiss (LEO) Omega 912 electron microscope. Digital images were captured using the SIS package (Soft Imaging Software GmbH, http://www.soft-imaging.net). Chlorophyll was extracted from 2-month-old rice plants with replicates from four different plants assayed per line. Leaf tissues of the same fresh weight (200 mg) were ground in liquid nitrogen and resuspended in 80 % acetone. After incubation overnight in the dark at 4 °C, cell debris was pelleted by centrifugation for 1 min at 15,000g and the absorbance of the supernatant was measured at 663 and 645 nm on a Unicam UV4 UV/Vis Spectrometer. Total chlorophyll was calculated as (8.02 × A663 + 20.29 × A645) × V/1,000 × W, where V = volume of the extract (ml); W = weight of fresh leaves (g) (Arnon 1949). To determine the GLK gene phylogeny, annotated plant genomes were searched using ZmGLK1 as a query sequence. GLK genes are distinguished from other members of the GARP family by the presence of a C terminal GCT-box and by an AREAEAA motif (consensus sequence) at the C terminal of the DNA-binding domain (Fitter et al. 2002). 57 GLK genes were identified (Supplemental Table S1). To confirm that GLK genes were not overlooked during manual searching, an alignment of a subset of GLK genes was used as a template for an iterative HMMer search of the 31 genomes used (Kelly et al. 2011). Phylogenetic analyses showed that 56 of the 57 identified GLK genes form a monophyletic clade that is a sister group to the pseudo-response regulator (PRR) group of GARP family genes (data not shown). The single Selaginella moellendorffii GLK gene clustered with the PRR genes due to the additional presence of a pseudo-response regulator receiver domain in the S. moellendorffii GLK gene sequence. Crucially, no new GLK genes were identified. Phylogenetic trees of the 57 GLK gene sequences were generated using Bayesian and maximum likelihood methods. Preliminary phylogenetic analyses suggested long-branch attraction in the Eucalyptus, Mimulus, and potato sequences and thus they were removed from subsequent analyses. The tree based on the remaining 50 GLK genes (Fig. 1) demonstrates two key points. First, all four C4 species in the dataset have two GLK genes (colored red). Second, some C3 species have a single GLK gene (colored purple), whereas others have two or more GLK genes (colored blue). These data are consistent with the suggestion that the last common ancestor of flowering plants had a single GLK gene and that gene duplication occurred in specific lineages. To determine whether the cell-specific accumulation of GLK transcripts is a general feature of C4 biology rather than specific to maize, we carried out RNA gel blot and transcriptome analyses of sorghum BS and M cells. Figure 2a shows a blot analysis of RNA extracted from the two cell-types. As in maize, transcript levels of the sorghum ortholog of ZmGlk1 (SbGLK1) are higher in M cells than BS cells, while transcripts of the sorghum ortholog of ZmG2 (SbGLK2) accumulate preferentially in BS cells. Figure 2b shows similar results from Illumina sequencing of RNA extracted from sorghum M and BS cells. Using a significance test of differential gene expression (Audic and Claverie 1997) followed by a Bonferroni correction, SbGLK2 transcript levels are shown to be significantly higher in BS than M cells. Although SbGLK1 transcript levels are higher in M cells than BS cells, the difference is not significant by this test. However, this is a likely consequence of RNA turnover during the enzymatic digestion process for M cell separation, as suggested by comparing transcript levels in M cells with those in untreated total sorghum leaves (where both SbGLK1 and PEPC are present at lower levels in M cells rather than being enriched as expected). Taken together, these data suggest that as in maize, GLK gene transcripts accumulate cell-specifically in sorghum. Maize and sorghum share a common evolutionary origin of C4 photosynthesis (Christin et al. 2007). To determine whether there is similar cell-specific compartmentalization of GLK transcript accumulation in species with an independent origin of C4 photosynthesis and a separate trajectory of GLK duplication, we carried out qPCR on RNA isolated from BS and M cells of the C4 species Cleome gynandra. The eudicot C. gynandra is the closest C4 relative to Arabidopsis and it has two GLK genes that are orthologs of AtGLK1 and AtGLK2 (Fig. 2c). Transcripts of CgGLK1 and CgGLK2 can be detected in both BS and M cells, but levels of both are significantly higher in M cells (Fig. 2d, e). In both cell types, CgGLK1 transcripts accumulate to tenfold higher level than CgGLK2. These observations suggest that compartmentalization of GLK function is not required for C4 chloroplast development in C. gynandra. The GLK gene duplication in the Poales (asterisk in Fig. 1) preceded the speciation of rice, maize, and sorghum. In both maize and sorghum, transcript accumulation is compartmentalized and in maize this compartmentalization reflects cell-specific function. To determine whether the rice gene duplication also reflects sub-functionalization, single and double-mutant lines were generated. An Osglk2 insertion line was identified in a T-DNA tagged population (An et al. 2003). Fifteen segregating T2 lines (01–15) were first screened by PCR for the presence of the T-DNA (see “Materials and methods”). DNA extracted from 11 individuals representing eight of those lines was then hybridized to an OsGLK2 gene fragment (Fig. 3b). Three individuals carried just the 13.7-kb fragment predicted for the wild-type Dongjin allele, five carried just the 11.7-kb fragment predicted for the insertion allele, and three carried both fragments. Further hybridization with a GUS gene fragment from the T-DNA insertion vector confirmed a single copy insertion of the T-DNA in the eight individuals containing the transgene (Fig. 3c). Five homozygous lines (02-02, 03-03, 09-01, 13-02, 13-03) that contain a single T-DNA insertion in the rice OsGLK2 gene (Os01g13740) were therefore identified. We named these lines Osglk2-1 to Osglk2-5, respectively. In all five lines, OsGLK2 transcript levels were barely detectable by RNA gel blot analysis, whereas OsGLK1 transcript levels were comparable to wild type (Fig. 3d). To generate an Osglk1 single mutant in rice, an RNAi construct was generated to specifically target OsGLK1. Figure 4a demonstrates the sequence overlap between the gene-specific RNAi (fragment 2), OsGLK1 and OsGLK2 genes. Following transformation of wild-type callus, seven independent lines were generated. DNA gel blot analysis of these lines demonstrated that transgene copy number ranged from one to three (Fig. 4b) and RNA gel blot analysis of four of the lines revealed substantially lower OsGLK1 transcript levels than in wild-type (Fig. 4c). OsGLK2 transcript levels were comparable to wild-type in all four lines (Fig. 4c). Double-mutant lines were generated by introducing an RNAi construct (containing fragment 1 in Fig. 4a) into callus of the Osglk2-2 single mutant line. RNA gel blot analysis of six T0 double-mutant lines demonstrated the absence of OsGLK2 transcripts and reduced levels of OsGLK1 transcripts (Fig. 4d). The degree to which OsGLK1 transcript levels were reduced varied between lines, presumably as a consequence of transgene copy number and/or position of transgene insertion. Unlike single mutants, the regenerated Osglk1,glk2 double mutants were phenotypically pale (Fig. 4e). However, further characterization of the phenotype was hampered by the fact that the regenerated T0 plants failed to produce seed. A segregating population of double-mutant plants was generated by crossing hemizygous Osglk1-2 RNAi lines with homozygous Osglk2-2 single mutant lines, and selfing the F1 progeny of the cross. A double-mutant plant in the segregating F2 population was subsequently selfed. The resultant F3 lines contained only double-mutant plants and thus the F2 parent was homozygous for both the Osglk1-2 RNAi transgene and the Osglk2-1 insertion allele. Given that the Osglk1-2 RNAi line carries three copies of the OsGLK1 RNAi transgene (Fig. 4b), DNA gel blot analysis was carried out to determine transgene copy number in F3 and F4 double-mutant lines. Figure 5a demonstrates that all nine double mutants examined carried three copies of the OsGLK1 RNAi transgene. This observation suggests that the transgenes may be linked as they did not segregate in the F1 cross. RNA gel blot analysis of the same nine plants demonstrated that both OsGLK1 (Fig. 5b) and OsGLK2 (Fig. 5c) transcripts accumulate to reduced levels in double-mutant plants as compared with wild type. The extent to which transcript levels are reduced is comparable to that seen in regenerated double-mutant plants (compare OsGLK1 hybridization signals in relation to amount of RNA loaded/WT hybridization signal in Figs. 4d, 5b, c). Unlike wild-type and single mutant plants, mature double mutants exhibit pale green leaf sheaths, leaf blades, and panicles (Fig. 5d–f). The relatively lower chlorophyll levels observed in double mutants by visual comparison of whole plants and leaf sections was confirmed by direct measurement. Figure 5h shows that chlorophyll levels are identical in wild-type and single mutants and that levels are ~65 % of wild-type in double mutants. To determine the extent to which chloroplast development is perturbed in single and double-mutant plants, leaf anatomy was examined by both light and transmission electron microscopy (TEM). In thick leaf sections, reduced chlorophyll levels are apparent in double mutants (Fig. 6a, b), and in thin sections reduced chloroplast size is observed in both BS and M cells of double Osglk1-2,glk2-2 mutants (Fig. 6c, d) but not in the Osglk1-2 RNAi line (Fig. 6e) or in the Osglk2-2 single mutant (Fig. 6f). The smaller chloroplast size in double mutants was confirmed by TEM (representative images in Fig. 6g–n). TEMs further demonstrated that in wild-type (Fig. 6g, h) and single mutants (Fig. 6i–l) both M and BS chloroplasts exhibit granal lamellae. The size of individual granal stacks is roughly equivalent in the two chloroplast types but given that M chloroplasts are generally larger than BS chloroplasts, the overall granal volume is greater in M cells. In double mutants, some chloroplasts appear relatively normal (e.g. Fig. 6m, lower right) but in most cases only rudimentary thylakoids develop (Fig. 6m, n). This perturbation to membrane topology is accompanied by the accumulation of vesicles within both M and BS chloroplasts (Fig. 6m, n). Therefore, despite being orthologs of the cell-specific GLK genes in maize and sorghum, OsGLK1 and OsGLK2 regulate chloroplast development in both BS and M cells. As land plants evolved from aquatic green algae, the GARP superfamily of transcription factors expanded through multiple gene duplications. This is evidenced by the fact that the sequenced genomes of the extant green algae Chlamydomonas reinhardtii and Volvox carteri contain four GARP genes, whereas those of the flowering plants Arabidopsis and maize contain 54 and 98 respectively (Riechmann et al. 2000; Plant Transcription Factor Database http://planttfdb.cbi.edu.cn/family.php?fam=G2-like). In land plants, the GLK gene members of the GARP family vary in copy number from one to four (Fig. 1) but no GLK genes are present in sequenced algal genomes. It is thus likely that GLK genes evolved through modification of GARP sequences prior to, or concomitantly with, the transition to land. Based on current evidence, it is most likely that ancestral land plants had a single GLK gene. Preliminary data suggest that this ancestral state is retained in the genomes of the extant hornwort Anthoceros punctatus (E. Frangedakis, S. Kelly, J. Fouracre and JA Langdale, unpublished data) and the extant liverwort Marchantia polymorpha (Kimitsune Ishizaki, Kyoto University, Plant Mol Biol Lab, Kyoto, Japan, personal communication). Although two genes are present in the moss P. patens, phylogenetic analyses indicate that these are the result of a recent genome duplication within that species rather than a gene-specific duplication (Yasumura et al. 2005; Rensing et al. 2008). The proposed ancestral single gene state is also retained in the lycophyte S. moellendorffii. Unfortunately, the paucity of genome sequence in other non-seed plants precludes further speculation on the timing of GLK gene duplication events prior to the divergence of the angiosperms. Within the angiosperms, the topology of the GLK gene tree reflects the multiple genome-wide duplications (GWD) that have occurred in the group (reviewed in Soltis et al. 2009). In the eudicots, patterns of gene duplication are complex but can be rationalized as follows. First, all of the observed GLK gene duplications post-date the ancient hexaploidization event that occurred before the divergence of the Rosids and Asterids (Jaillion et al. 2007) because orthologous GLK gene relationships cannot be demonstrated between species of the two groups. In the Rosales, the two GLK genes in M. domestica reflect a family specific GWD within the Maleae tribe (Velasco et al. 2010). In the Fabiales, two GWD events within the legumes—one around 54 million years ago before the divergence of soybean and common bean from Medicago and one around 13 million years ago within soybean (Cannon et al. 2010; Schmutz et al. 2010)—explain the presence of two GLK genes in the genome of P. vulgaris and four genes in the G. max genome. The single gene in M. trunculata infers gene loss in that species sometime after the original legume duplication. In the Malpighiales, the two GLK genes in P. trichocarpa reflect a family specific GWD within the Salicaceae (Tuskan et al. 2006) and the three GLK genes in L. usitatissimum suggest within-species duplications. The two GLK genes in M. esculenta and the single gene in R. communis support a duplication within the Euphorbiaceae followed by gene loss in R. communis. The specific evolutionary trajectories leading to duplicate GLK genes in the C4 eudicot C. gynandra and the C4 monocots maize and sorghum, can be rationalized as follows. In the Brassicales, there is one GLK gene in C. papaya, two genes in four of the other sequenced genomes and four genes in the Brassica rapa genome. The topology of the gene tree in Fig. 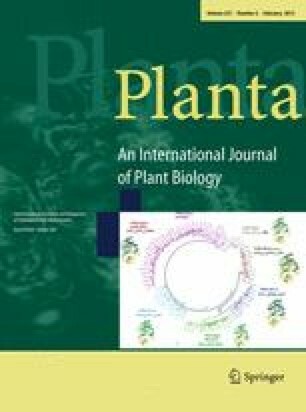 1 suggests that the original duplication resulted from the GWD that occurred after the divergence of Capparaceae from Brassicaceae and Cleomaceae, but prior to the divergence of Arabidopsis and B. rapa (Blanc et al. 2003), and that a subsequent GWD occurred within B. rapa. Despite reports of independent GWD in the Cleomaceae and Brassicaceae (Schranz and Mitchell-Olds 2006), our phylogenetic evidence indicates that the C. gynandra GLK genes are orthologs of the Arabidopsis genes (Fig. 2c). Thus, GLK gene duplication occurred prior to the evolution of C4 within the Brassicales. In the monocots the situation is similar but more straightforward. The six sequenced monocot genomes represent genera in the order Poales. Given that all six species contain two GLK genes, and that the tree robustly resolves orthologous and paralogous relationships (Fig. 1), it is clear that a single duplication occurred prior to speciation in this group and hence prior to the evolution of C4. This observation is consistent with the reported GWD in the Poales (reviewed in Soltis et al. 2009). Given that the single GLK genes in the genomes of C. sativus, A. coerulea, P. persica, C. sinensis and V. vinifera correlate with the absence of C4 species in the respective orders (Cucurbitales, Ranunculales, Rosales, Sapindales, Vitales) (Sage et al. 2011), it is tempting to speculate that GLK gene duplication was a prerequisite for C4 evolution. Notably, although a single gene is present in R. communis, and C4 species are present in the Euphorbiaceae, gene loss is inferred in this case as discussed above. More genome sampling is required to confirm or refute the suggestion that GLK gene duplication preconditions C4, and to address the importance of gene duplication for the evolution of C4 photosynthesis in general (Monson 2003; Williams et al. 2012). The presence of two GLK genes in maize and sorghum is associated with compartmentalization of GLK gene activity in BS and M cells, suggesting that each gene may have a cell-type specific function in C4 plants more generally (Rossini et al. 2001). In the C3 plant Arabidopsis, GLK transcription factors act cell-autonomously to regulate a suite of genes involved in light harvesting and chlorophyll biosynthesis (Waters et al. 2008, 2009). In so doing, GLK activity modulates thylakoid stacking and the assembly of photosystem complexes. In both maize and sorghum, BS and M cell chloroplasts exhibit different degrees of thylakoid stacking and different compositions of photosystems. PSI functions in agranal BS chloroplasts whereas both PSI and PSII function in granal M chloroplasts. These differences could result from specialized cell autonomous activities of the compartmentalized GLK proteins or could be mediated through interactions between GLK proteins and BS or M cell-specific partner proteins. The latter suggestion is certainly plausible given that the two Arabidopsis GLK proteins have been shown to hetero- and homo-dimerize (Rossini et al. 2001) and to interact with G-box binding proteins (Tamai et al. 2002). Whilst the cell-specific role of GLK genes in maize and sorghum is consistent with the suggestion that compartmentalization of the two proteins is required for chloroplast development in C4 plants, cell-specific accumulation of GLK gene transcripts was not detected in BS and M cells of the C4 eudicot C. gynandra (Fig. 2d, e). It is possible that cell-specific activity of GLK proteins is regulated post-transcriptionally in C. gynandra. However, given that both BS and M chloroplasts of C. gynandra are granal (Marshall et al. 2007), and hence less morphologically distinct than those of maize and sorghum, it is also possible that there is no need for specialization in this species. Compartmentalized GLK function may thus be restricted to C4 species with dimorphic chloroplasts. Such dimorphism is found in chloroplasts of both C4 eudicots and monocots (Laetsch 1974). In most species examined, genomes containing more than one GLK gene have undergone a recent GWD event. Given that such events are normally followed by progressive diploidization and the reduction of DNA content (Wolfe 2001), the question remains as to why GLK gene pairs persist in C3 species where they essentially function redundantly to regulate chloroplast development in all photosynthetic cells of the leaf (Figs. 4, 5, 6; Fitter et al. 2002; Yasumura et al. 2005). Because the proposed role of GLK genes is to balance the light and dark reactions of photosynthesis in order to optimize carbon fixation (reviewed in Waters and Langdale 2009), we hypothesize that in C3 species with multiple GLK genes, some degree of sub-functionalization has occurred. This suggestion is supported by recent studies demonstrating differential responses of the two GLK genes in Arabidopsis to organic nitrogen (Gutiérrez et al. 2008), perturbed plastid import pathways (Kakizaki et al. 2009) and cytokinin (Kobayashi et al. 2012). Some developmental specialization can also be seen in that only AtGLK2 functions in the siliques of Arabidopsis (Fitter et al. 2002). These observations therefore suggest that in both C3 and C4 plants, the coordinated and combined activity of GLK proteins acts to integrate environmental and developmental signals to maximize carbon assimilation. We are grateful to all colleagues in the C4 rice consortium (irri.org/c4rice) for stimulating discussions. The pUC-RNAi and pXQAct vectors were kind gifts from Prof. Chengcai Chu, Institute of Genetics and Developmental Biology, Chinese Academy of Sciences. This work was funded by a grant from the Bill and Melinda Gates Foundation to JAL, JMH, PW and WPQ, and by the Oxford Martin School to JAL. JF and S. Kelly were supported by a studentship (JF) and systems biology fellowship (SK) from the Biotechnological and Biological Sciences Research Council (BBSRC). SA was supported by an EU Marie Curie Grant PIEF-GA-2009-253189.